There are 3 main steps that need to be done to get a clinic setup on BI. Setup the clinic's databases in Zoho. Setup SpecVet BI Integration Settings, and do initial data upload. Login to reports.zoho.com, and navigate to the HOME page, where the list of clinic databases is shown. Select "SpecVetBIMaster" and unselect the "with data" checkbox, provide new name, and say OK.
New database should now be created. Enter in appropriate details for the new user (use password as PW). 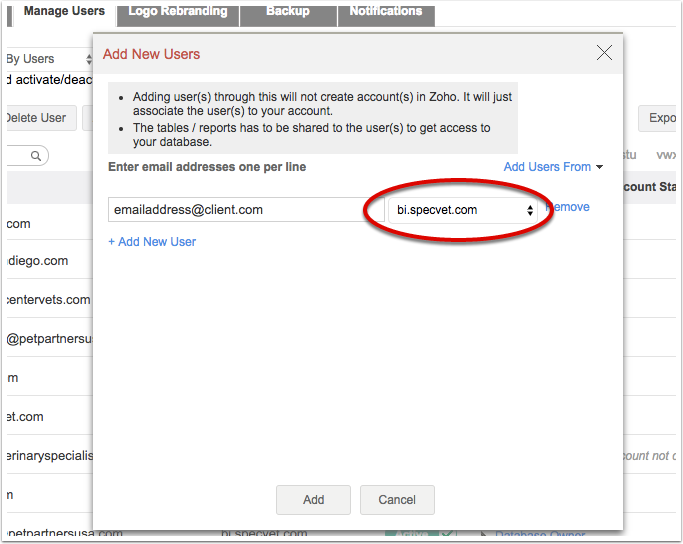 Return to our Zoho Reports HOME PAGE, select SETTINGS, Manage Users then Add New User. Enter the aforementioned email address, and ensure you select "bi.specvet.com" from the drop down. This step associates the Zoho user to our BI system. Note, we may need to add another user to our subscription. That is done from the SUBSCRIPTIONS link off of HOME. 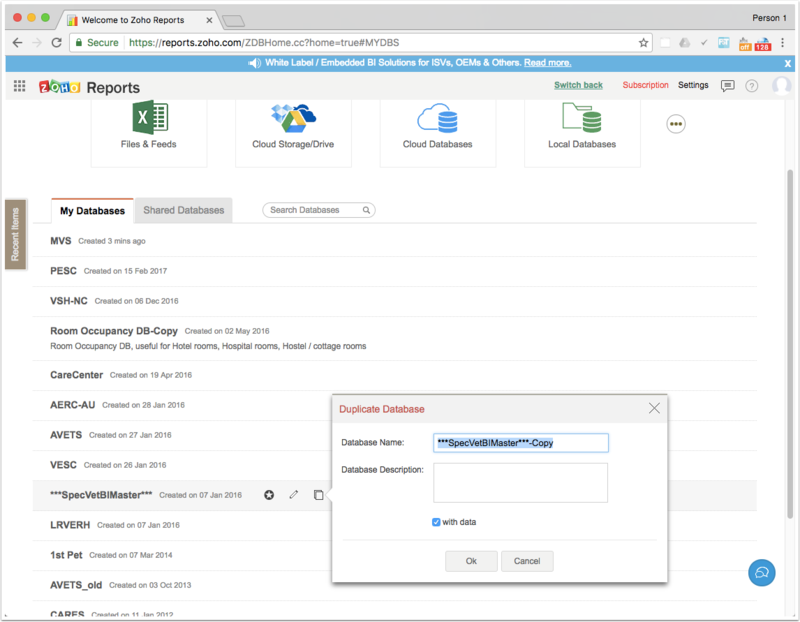 Return to the Zoho Reports HOME. 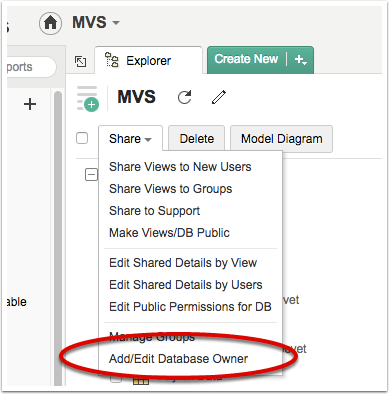 Select the appropriate database, click SHARE and select "Add/Edit Database Owner:. Select Add Users From... then My Zoho Contacts, selecting the approrpriate user. At the next window... deselect the Send Email checkbox... we do not want that email going out to them. Prepare an email to the client with the link to the bi, etc. From within the client's SpecVet.. Select SETUP then SETTINGS. Enter in "BI" to the filter, check the value for: bi.ZohoTableName. Ensure that that matches the table name in BI. Setup the QUERY DAYS to the appropriate values for all records in the BI Integration table. Typical / normal setup is 30 days for all 3 records. When doing an initial load, you can adjust. Note that if large amount of data, may need to do more of a manual upload of data. "User" account and typical SV PW. Time Limit & Abort setup to 30? Scheule at the 2-4 AM hours, between other backup scripts, to occur daily. 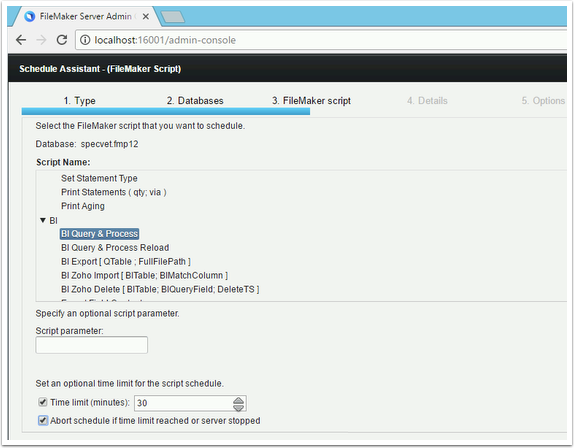 Run the scheudle from the server, and check the logging in the BI Integration screens in SpecVet to ensure that they worked. (Make sure you have committed the BI records). After the initial processing, ensure you set the QUERY DAYS back to appropriate values.